$150 with free shipping - limited time introductory offer! there is a small update and typo error that will be rolled out in the next harness production, but in case you have a harness from the recent batch you can follow this change and make your harness match. the 3 labels on the bottom will remain unchanged. the 2 labels on the top will change. A. the flasher relay label will now have both the black and the grey wires inside. B. The grey wire will no longer run through any other labels. D. harness to hand controls label that used to have the grey wire and black wire inside will now have only the (black) and (black+blue stripe) wires inside. THANKS FOR NOTING THIS CHANGE BEFORE THE NEXT SHIPMENT DROPS! Dealer inquiries will be accepted for 10 or more wire harnesses. ~ More complete than any harness on the market because it comes with not only all of the essential connectors but also pre installed fuses, relays, and universal rectifier. 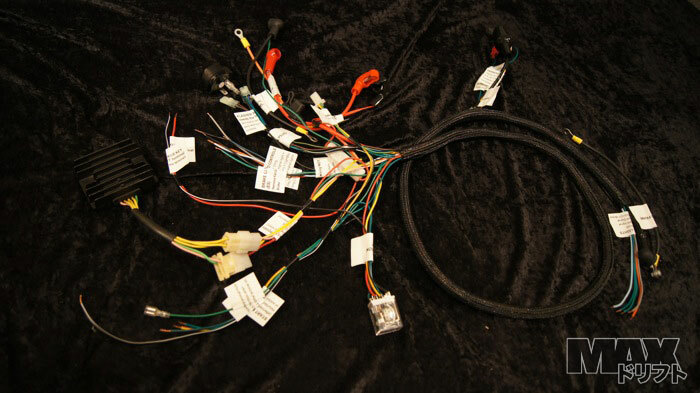 ~ Each harness is manufactured and tested to OEM automotive standards. Every harness our brand or others will need to be cut and tucked differently for each scooters build and accessories for the cleanest possible look. You should cut & solder to eliminate as many plugs as possible to maximize reliability no matter which harness you choose its worth the few minutes difference now so you don't have to troubleshoot later. Listed below is every connection and the connection type. 11 pole is backwards compatible for all stators. 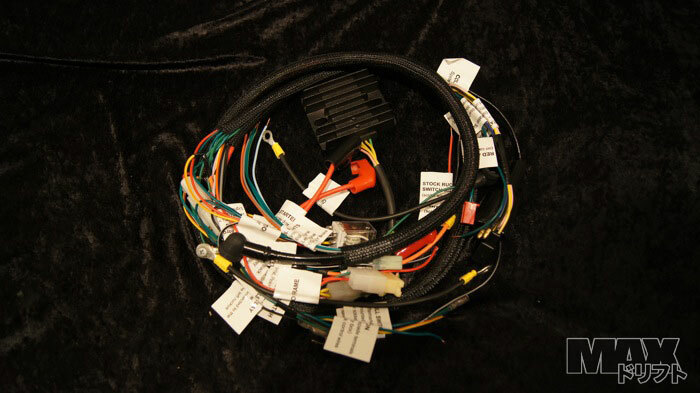 "4 into 2" Ignition relay is included and integrated into the harness for you! If you are missing any of those items, buy from http://www.partsforscooters.com. *make sure there is a ground connection between your front and rear frames!! I'll make a install video if time permits, but this is super easy - each individual wire is labeled for you so you can get it done quick! 2. You can take all the stuff connected to the stock wire harness off of the neck like the ECU, "1076" black box, "20w68ohm TG-28" silver bracket. 3. You can keep the stock high beam and gas lights there to fill the holes if you run the OEM right controls, but they will no longer operate. 4. If you run the OEM right controls, please note that the RUN/KILL switch's operation is reversed. This is due the the difference in Honda and GY6 controls. 5. You can fill the holes where the High beam and Gas lights used to be with momentary start and kill switches if you use an aftermarket throttle without built in switches. 6. If you have a hydraulic brake lever, you will need a hydraulic brake switch to connect it to the harness and activate the tail lights and starter relay. 7. If you have a T-Motorsports GY6, Its got a DC electrical system, so you will need an 8 or 11 pole AC stator to work with the rectifier on this harness. 9. make sure there is a ground connection between your front and rear frames, especially if you powder coated one or both, run a ground wire, or sand the 2 bolt front to rear frame connection to bear metal and use dielectric grease to maintain your bare metal grounds. Make sure the engine to frame ground is also touching bare metal. 10. The OEM 35watt headlights are pretty weak for use with GY6 speeds, consider getting HID's if 11 pole stator is used. 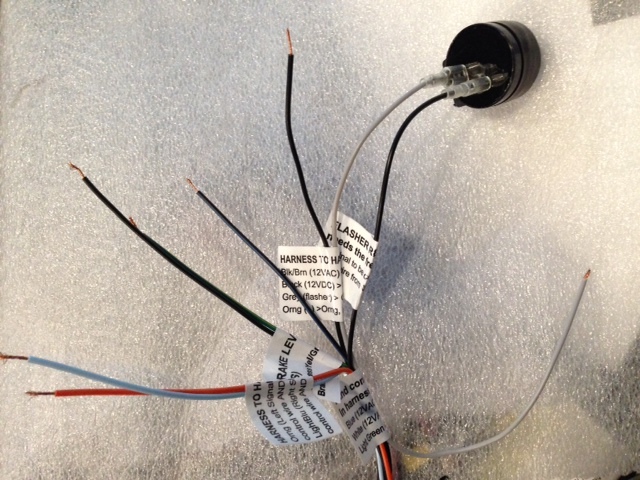 Some customers have suggested this as an alternative to resistors: "Variable load Electronic LED flasher"
Pay attention to the voltage requirements of LED tail lights and your charging system output to make sure they are in sync. 12. Make sure the clear relay's exposed metal posts are taped up really good so they don't touch anything. 13. The battery has to be good. 11.5 to 12 volts when the scooter is off and 13.5-14 when the scooter is on is a healthy battery. Below that would indicate a shorted cell and above that would indicate a bad open cell giving high resistance. Since the battery is the only thing on a scooter that absorbs the voltage being put out by the simple charging system, if it is in bad condition as described above or disconnected while the bike is running (power wire breaks, or you pull the +/- terminal off, bad ground) the lights will see too much current and will blow. 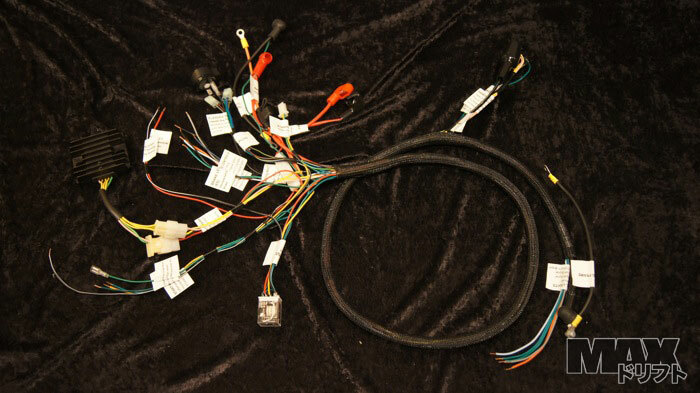 (BUT if you have an 11p stator which has too much power to run typical headlights without blowing them, don't connect Black/Blue harness wire. 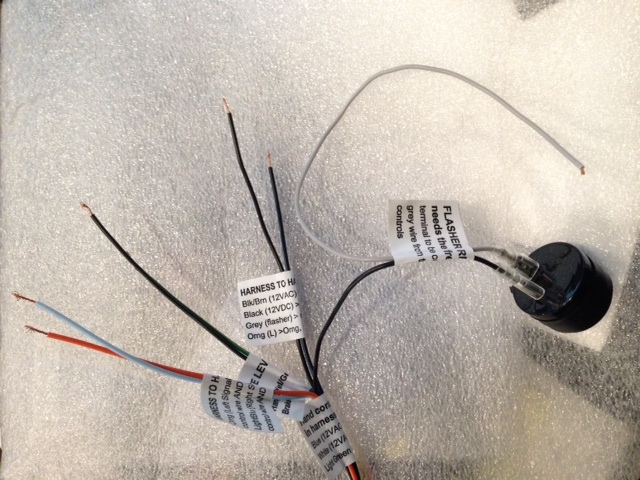 Instead do a Y connection of the Black DC harness wire AND Black AND Black/Brown from the left controls so that the accessories are all DC powered, don't do the y connection here with a 6 pole or the battery will die from too much DC power draw) Alternatively 11p and AC headlights input could benefit from an AC voltage regulator as stated above in the tips/tricks. 3. Yellow/White > Dont connect this at all, because its only used on 11 pole stators. About Black in the MAX harness stator plug (Item #1 below) at the stator plug (coupled to the yellow) is a power feed for the autochoke. If you dont run auto choke, you can remove the choke plug and its black power wire & ground all together. Make the Fuel light work! Connect Fuel Sending Unit (tank float) signal (blue/white) to led Drive unit (blue/white) and to resistor (20w 68 Ohm) blue/white. Connect ground green/black on sending unit and module plug to ground"